Did you see those clips of the two Russians on the news last night? They were broadcast originally on Russian state TV station RT (Russia Today), and showed the two suspects in the Skripal poisoning looking very shifty and claiming they’d been to Salisbury to see its famous spire. I watched it mainly on Channel 4 News, usually a reliable source for in-depth reports. Jon Snow was openly dismissive of the Russian story, the two men being referred to as “these two characters” and their claims to have been put off visiting Stonehnge by the snow greeted with open hilarity – how could Russians be put off by a bit of snow? Ridiculous! Admittedly they looked nervous and embarrassed, but then if you’d been accused of poisoning someone, mightn’t you be nervous? Even if you hadn’t. And since British society bristles with cameras everywhere – on the street, at service stations, in shops – given this multitude of cameras, how is it we see the pair just once, walking along a street? Amazingly, this story folds into one about the EU (there’s no escaping it, Virginia – sorry). 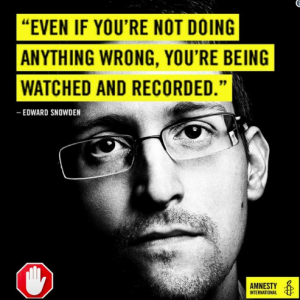 In a challenge to the UK’s spying laws, the European Court of Human Rights has found that “The UK’s regime for authorizing bulk interception was incapable of keeping the ‘interference’ to what is necessary in a democratic society.” Lucy Claridge of Amnesty International says that the ECHR ruling “sends a strong message to the UK government that its use of extensive surveillance powers is abusive and runs against the very principles that it claims to be defending.” And did I mention that the UK can’t wait to get clear of the European Court of Human Rights via Brexit? So we have the absurd situation where the UK is mocking the activities of these two Russians in Salisbury, even while Britain has used mass surveillance to spy on anybody it wants throughout the world. Including, as it happens, human rights groups. You don’t have to be nervous and even paranoid to think they’re out to get you. Because they are. Have been for some time.